High-D possesses a powerful layout, data processing, and rendering engine that offers a vast choice of customization possibilities. The configuration panel gives instant access to all the key settings, where each section can be further expanded to expose the full palette of choices to fine-tune the appearance of the various views. The Color drop down list gives the possibility of selecting which variable should be used for coloring the shapes. Import a colormap definition and apply it to the currently selected color variable. 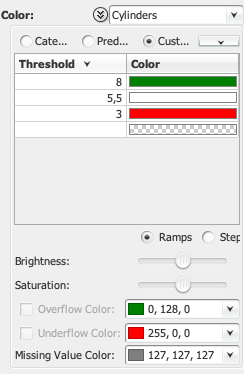 Export the colormap definition of the currently selected color variable. Copy the colormap to the clipboard. Export the colormap to a raster or vector-based graphic format. 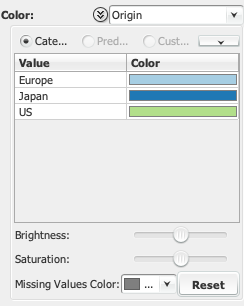 If a categorical variable is selected, then colors are automatically assigned to each of the value. Each color can be individually customized by clicking on the color itself. Each color can be individually changed by clicking on the color cell. If the data contains missing values, then their color can be edited here. Allows to reassign all the values to their default color. 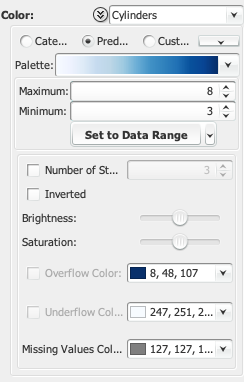 If a numerical variable is selected, High-D offers the possibility of setting the lowest and highest values that should be mapped to the selected colormap. If the variable contains negative values, the range is automatically made symmetric. Sets the upper bound of the colormap. Sets the lower bound of the colormap. Set the minimum and maximum of the colormap to the minimum and maximum values of the data. Will make the colormap symmetrical should it contain negative values. Will round the minimum and maximum values to their next power of 10 value. Can be used to segment the palette into a specified number of discrete colors. The color luminance can be adjusted by increasing or decreasing its brightness. The color intensity can be adjusted by increasing or decreasing its saturation. If some of the data values fall above the upper threshold, then their color can be edited here. If some of the data values fall below the lower threshold, then their color can be edited here. For more customization possibilities, it is also possible to define a custom colormap by setting thresholds at given values. High-D will take care of interpolating the colors if Ramps mode is selected, or will make them valid for the whole range in Steps mode. Define the threshold for which values equal or above its value will be assigned the associated color. Removing a threshold can be accomplished by setting its color to None. New thresholds can be added by specifying a value in the last entry of the table. The color associated to the new threshold will be automatically extrapolated from the current colormap definition. The color associated with each threshold. Indicates whether the values should be interpolated within the threshold ranges (Ramps) or made discrete (Steps). 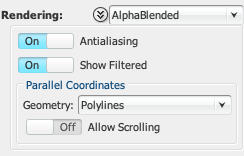 More options can be customized in the Rendering pane. Each visualization can be rendered using AlphaBlended, Density, or Opaque drawing schemes. Gives the possibility to disabled antialiased drawing. Allows to make filtered items visible. Points in the parallel coordinates plots can be connected using Polylines, Steps, or Polycurves. Copy the legend to the clipboard. Export the legend to a raster or vector-based graphic format.